After contacting Porsche Silverstone about my 2005 Boxster S and providing pictures -attached - the "repairer" elite-motors.co.uk based in Northampton told me Porsche wouldn't cover it under warranty. The rust is not from the inside out?? what is the stated warranty? From your picture it looks like surface corrosion, which likely has a different warranty coverage than perforation. I worked in the industry for years and the company I was with had a 3-year surface corrosion warranty and a 5-year perforation, or rust-through warranty. Panels that rust through generally do so from inside out. Surface corrosion can rust through of course too, but since it's visible it should be repaired before it gets that bad. That's kind of up to you if it's past the manufacturer's surface corrosion warranty. Your car is 10 years old now, but I don't know what Porsche's surface corrosion warranty was. Not likely 10 years. I'd say on a 10-year old car you're asking a lot for any manufacturer to take responsibility. Because the car panels are galvanized on the inside and outside the chance that you have an inside out corrosion is very very low. On a not galvanized car this would be looking much worse. To get this repaired the galvanization should also be renewed – which isn't an easy fix. The warranty for an inside out corrosion was 10 years. So in 2016 you're no longer in this time frame with a 2005 car. Also it's not inside out. Let the repair be done professionally. Avoid to much loose gravel and have fun with your Boxster again. I will be replacing the Cats on the vehicle over the next week. I have had a quote for the rust which seemed ok. Yes, you do. Then you complain that Porsche won't pay for your carelessness. 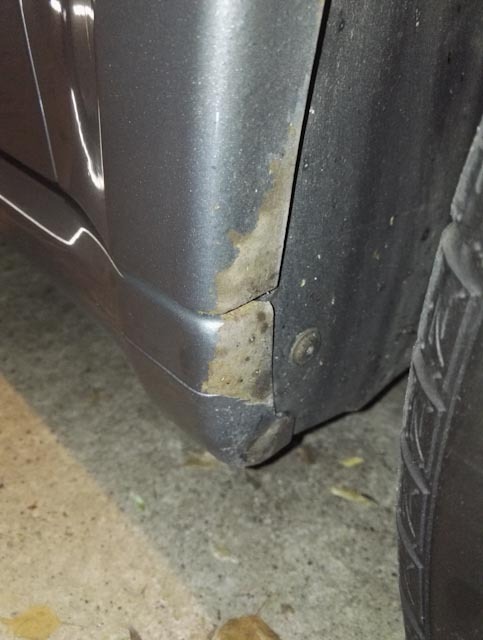 As said before, that is clearly surface corrosion caused by the road conditions you drive in while not properly taking care of your car. Wash it more often if you're going to drive it in bad conditions.